the Hill Country where the best tea of all is grown. It really is exactly like the pictures on the PG Tips packets. Orchids grown in the Botanical Gardens just outside Kandy. I have been saddened by the news that is coming in of the damage that has been done to Sri Lanka and other countries by the tsunami. Many of the places I've mentioned in the article which follows were directly in the path of the tsunami. I'm frightened to think what might have happened to the owners and staff of the various restaurants and rest houses at which we stopped. I'm very relieved however, to know that Sunny and his family are all safe and well and their house is intact. 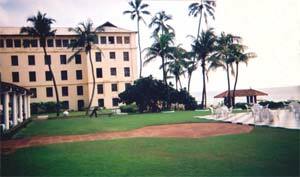 I understand the Galle Face Hotel, was unaffected and that many of the coastal hotels, being very substantial buildings, did not suffer major damage. Many had already re-opened within a week of the tsunami. Of course, this is no compensation for losing a home and/or family members, but it does mean that at least a lot of people will still have jobs, provided the tourists continue to arrive. Sri Lanka is a beautful island full of lovely people. I'm not at all surprised that so many tributes have been paid to them by returning tourists. It's no less than I'd have expected. I'm hoping to return sometime this year. It will take a lot more than a tsunami to stop me. I hope others feel the same way. 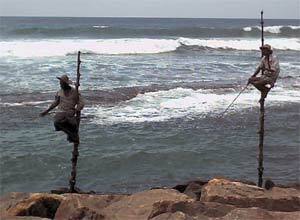 So many Sri Lankans depend on tourism. 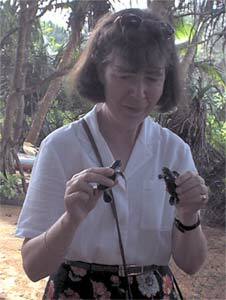 About a visit I made to Sri Lanka early in 2003. I have an affiinity to islands. Perhaps it's due to being born on one. Whatever the reason, they always seem to feature as my favourite holiday destinations. Even so, no one could have prepared me for the impact Sri Lanka would have on me. I first went to Sri Lanka 10 years ago and had wanted to return ever since. For a long time, the nearest I ever got to it, was keeping in touch with Sunny, the chauffeur guide who'd helped to make the first trip so memorable. Through photos, I watched his two sons, now 11 and 9, growing up. The damage that the Tamil Tigers did to the island worried me whenever I read about it in the British newspapers, not just for the deaths they caused, but because it also hit tourism and thus had a knock on effect on a family I knew and cared about. The possiblity of a return first cropped up last Spring, but it was all dependent upon finding a cat sitter to look after the boys. That solved (thanks Eileen, I really appreciated it), Jen, who'd spent 10 years hearing tales of my last trip and had no intention of being left out of this one, and I, started planning in earnest. We made our own arrangements. This meant that, for a while, we had our flights booked, but no firm hotel booking. We looked around for local evening classes on building your own house out of plaited palm leaves, but they seemed to be thin on the ground. We consoled ourselves with the thought that, if we cut ourselves plaiting the palms, or got bitten by anything unmentionable, at least our holiday insurance was in place and we'd get free treatment! Fortunately, the hotel booking came through well before we needed to put any of these plans into action. 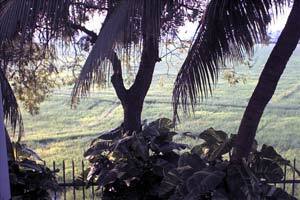 So it was that, on the morning of 14th January 2003, I found myself back in Sri Lanka. Sunny was at the airport to pick us up and take us to the Galle Face Hotel in Colombo. This was to be our base for the duration of our stay. The Galle Face Hotel is unique. On the ocean, but in central Colombo, it's the oldest hotel on the island. Full of character and with a very imposing frontage, it's still a little old fashioned in terms of furnishings and fittings. We were startled to see a gardener valiantly mowing a vast expanse of lawn with a small, rusty, manual lawnmower. I can also still see the horrified look on the face of the Director of Operations when we excused ourselves at the end of a cocktail reception, held by the hotel for its long term and repeat guests. Our reason? To check if the leaks we'd experienced in our suite during the previous tropical storm had returned during the current one! While the hotel might lack some of the modern touches, state of the art living isn't everything. Far more important to us was that The Galle Face Hotel can't be beaten for its atmosphere and friendliness. I especially liked the little homilies that greeted you in the passageways. "Please do not smoke in bed or the ashes we find may be yours." "Please use the stairs, it's only one flight and it will benefit your health." 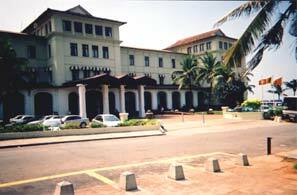 The front of the Galle Face Hotel. It is the oldest hotel in Sri Lanka and the only hotel actually on the beach in Colombo. The grounds of the hotel. The pool is behind the palm trees. 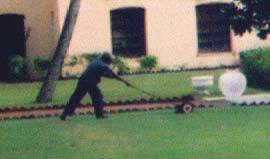 Detail of the gardener mowing the huge lawns. Devi and Gunny provided a personal touch when we went to the pool area. Gunny, who knew I liked to write when I was there, always did his best to make sure I had my "special" table. (On one occasion this included trying to remove it from a gentleman who was trying to eat his lunch on it.) Devi gave us the breakdown on the spectacular Sri Lankan weddings that were a daily event there. The hotel's currently being refurbished, so next time we stay there (and nowhere else would be the same now), I hope we find that they've succeeded in their aim of retaining the character, but repairing the leaks! Neither Jen nor I are lovers of "resorts", so a bonus for us was that whenever we left the hotel we stepped straight into everyday life rather than the artificial society that grows up around a tourist centre. Everyday life however, included negotiating crossing busy main roads. If there's a Highway Code in Sri Lanka, no one seems to take any notice of it. If you're a pedestrian, the general idea seems to be close your eyes, stretch out your hand (palm downwards), and hope the traffic weaves its way around you. That we finished the holiday with all our limbs intact is surely due to the helpfulness of the local people, who allowed us to attach ourselves to them, (metaphorically speaking that is) and led us safely over the road. The local supermarket, "The Elephant House", was only a few hundred yards away. It was not generally used by tourists and we were as much of a novelty to the shop as it was to us. On one occasion, when trying to simplify a transaction only resulted in us complicating it, we even gathered a very goodnatured crowd. They laughed, we laughed and the confusion sorted itself out. Despite being in Colombo, we were still prey to the local tourist scams, but we'd been well briefed by Sunny. The most common one was to be accosted by individuals who explained to us that they were teachers at the local school for deaf and blind children or, alternatively, the local orphanage, culminating in asking us to sign a paper committing us to donate money. Had even half of the supplicants been telling the truth, Sri Lanka would be remarkable for the vast number of special schools there. Not to mention the amount of children who'd had the misfortune to be orphaned. The value of money is one of the most startling things about a trip to Sri Lanka. I would never describe myself as poor, but here in the UK I spend my life budgeting in order to pay all the bills and still have enough money left over to be able to afford to do all the things I want to do. In Sri Lanka, I suddenly become seriously rich. Many everyday items are a tenth of the UK price. If I lived in Sri Lanka and budgeted the way I do in the UK, I could probably live comfortably on £10 ($15) a week. It's a very strange feeling. On the one hand, it's wonderful not to have to consider the cost of anything at all. To wander in and out of hotels, the British equivalent of which would have me drawing a sharp intake of breath at the cost of even a cup of tea. To plan tours without having to keep a tally of the cost. To go into a shop and buy without needing to ask the price first. On the other hand, it's uncomfortable being aware of the financial differences between me and my Sri Lankan counterparts, which occur purely as a result of the two different economies. Sunny had lent us an excellent guide book so we were able to explore a lot of Colombo on foot. To see the rest of the island, transport is a must. Coach and mini bus trips are easily bookable, but by far the best way is to travel with a chauffeur/guide. When the chauffeur/guide also happens to be a long standing friend, the tours become really memorable. Touring in Sri Lanka requires a degree of stamina. How the chauffeur/guides aren't on their knees by the end of the day is beyond me. Sunny just says, "It's my job, it's what I have to do and I'm used to it." Somehow I can't imagine anyone in Britain coming up with such a philosophical approach. Here's an example of what we covered in a typical tour day. During our second week, we went on a tour of the west coast. Sunny had asked us to be ready for a 6 am start, so we actually got up at 5.15. Sunny, who had a 40 minute drive to reach our hotel must have been up even earlier. After driving for a couple of hours, we stopped at Bentota for a tea break and, in Sunny's case, breakfast. Then on to a turtle hatchery where we heard how the eggs were collected and saw what happened when they were brought to the hatchery. The turtle hatcheries collect the eggs, keep them buried in the sand, in a safe area, until they hatch and then keep the babies for 3 days before releasing them into the ocean. I'm holding two day old babies in this picture. From Bentota, we went to Ambalangoda to look around a Mask Factory and Museum and to watch the masks being made. Further down the coast at Hikkaduwa, Jen went for a ride in a glass bottomed boat. By this time it was about 12.30 pm. The boat owner, Jen and Sunny set off for a trip in a glass bottomed boat. 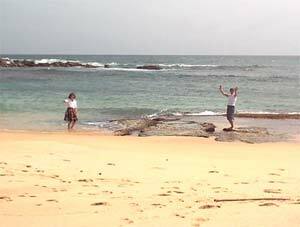 Right on the southwest tip of the island is Galle, the old Dutch capital. A lot of the fortifications are still in place and we were able to stroll along some of the ramparts. 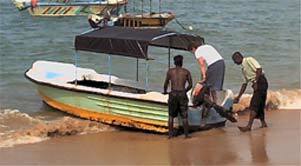 But not for too long as Sunny wanted us to see Weligama, a fishing village where the fishermen are famous for "stilt fishing". At 3 pm we reached Tangalle and finally stopped for lunch. By this time, we'd been on the road for 9 hours. My lunch was a soufflé omelette with bananas and palm treacle. From Tangalle, we headed inland to Bundala, one of the National Parks, as Sunny wanted to take us on a jeep safari. Our safari was around an area known for its birdlife,. Along with Sunny, who was for once a passenger, we were escorted by a guide as well as the jeep driver. It will be a long time before Jen and I forget standing by the edge of a lake to stretch our legs, only to have the guide point out a couple of crocodiles basking in the shallows. We were ready to do a standing jump straight into the back of the jeep at the first sign of one of them coming to life and showing an interest in us, but everyone else was most unconcerned. The jeep safari was the last item on Sunny's agenda and from there he took us to a local hotel where we were to spend the night. By the time we arrived at the hotel, it was 7.15 pm. However beautiful a country, a visit can be made or broken by the friendliness of the people and sometimes, just the little things that you look back on with a smile or a sigh. In Sri Lanka, all were overwhelming. Stopping by the roadside to give some children lollipops and biros and seeing a sturdy 3 year old emerge from the nearby house like a bullet out of a gun, little legs flying like pistons and a frantic look on his face at the thought of being too late. The dignity and close loving bonds of familes so poor it defies anything we see in the UK. Sunny asking a young, barefoot boy why he wasn't at school and being told it was because his family couldn't afford to buy him shoes. Being told, completely straightfaced, by a young hotel waiter one morning that the hotel had run out of tea. He managed to maintain his deadpan appearance through my disbelief (Sri Lanka is the world's third largest tea exporter), so that I finally began to think he was telling me the truth. Only then did his face break into a huge grin at the success of his practical joke and we all laughed together. Buying Sri Lankan scratch cards and sitting in open air rest houses drinking tea with Sunny and attempting to win a tuk tuk, one of the many prizes. We'd agreed on a three way split of any winnings, but this proved to be a little difficult with the prizes of 10 and 20 rupees (3.3p & 6.6p respectively), which were all that we ever won. with a 20 rupee win on a scratchcard! Having the most hair raising ride of my life in a tuk tuk driven through Columbo streets, heavily congested with traffic, by a driver who clearly thought he was immortal. The sight of the burnt out shell that was all that was left of the bank in Colombo that was bombed by terrorists a few years ago. Being invited, by the bride's brother, into her wedding reception at the Galle Face Hotel. All the monkeys and elephants. Three monkeys renoving fleas from each other. 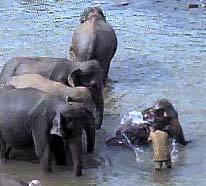 Three elephants keeping a close guard on an orphaned baby as he's washed by a handler. The realisation that, despite the completely different cultures, religions and lifestyles, we shared the same opinions on many fundamental things and the same sense of humour. The many kindnesses and the numerous running gags that are too personal to write about here. Thank you to everyone who helped to make my holiday in Sri Lanka such a memorable one. I hope to see you all again. You can never be sure what you'll find on Ann's Page. It changes approximately every 8 weeks or so and it's completely different each time. If you'd like to see what was previously on Ann's Page, go to our Archives If you'd like to know when Ann's Page changes, please feel free to join our mailing list.